Video editing is one of the most demanding tasks you can execute on a computer. A modern video-editing program such as Adobe Premiere requires high performance from the processor, RAM memory, GPU (if using GPU acceleration), as well as storage drives. Choosing a fast storage solution can be a little tougher than picking the fastest computer processor, as there are more tradeoffs involved. The largest drives aren’t always the fastest, and speeds can vary a great deal. This guide was created to help you choose the right storage drive (or drives) for your editing needs, from the small to the large. "The first step in choosing a drive is to determine how much storage space you need, as well as how fast your data can be stored and retrieved." The first step in choosing a drive is to determine how much storage space you need, as well as how quickly your data can be stored and retrieved. The biggest determining factor is what codec and resolution you will be editing in primarily, since the amount of space that different video codecs occupy varies widely. 1080p ProRes HQ, a popular editing codec, will set you back about 112GB an hour, whereas 1080p AVCHD only takes up about 11GB. It's also important not to confuse bits and bytes. Most codecs rate their speed in bits per second, whereas most hard drives publish their speeds in bytes per second. XDCAM EX's 35Mb/s is actually only 4.5MB/s. A handy tool for determining the amount of bandwidth you need is the AJA DataCalc app, which is available for Windows and Mac at AJA's website. It's also available for iOS in the Apple App Store. This tool lets you pick the codec you will be using, and it tells you how much bandwidth a single track of that codec needs in bytes per second. If you will be editing HD content without a huge number of tracks, then a high-performance 3.5" drive will probably be fast enough to meet your needs. Current high-end 7200 rpm 3.5" drives are able to reliably deliver speeds at 150MB/s or higher, in capacities as high as 4TB, which is enough to play back numerous tracks of lightly compressed video, such as DnxHD or ProRes. 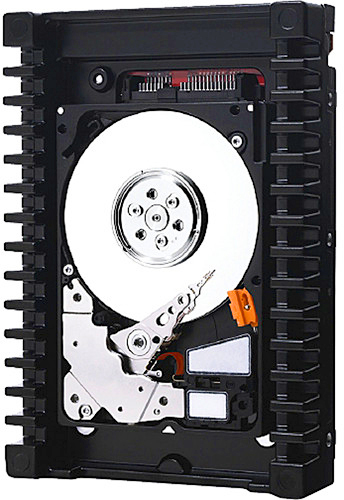 Some recommended 3.5" drives are the 4TB Western Digital Caviar Black, the 3TB Seagate Barracuda, or the 4TB Hitachi Deskstar. All of these drives should give you at least 150MB/s of sustained transfer speed for video editing. Lower-performance 3.5" drives (or 2.5" drives) are not recommended for video editing, even if their published speeds are fast enough. These kinds of drives are often not designed to sustain those speeds. If 150MB/s isn't enough, and you still prefer using a single drive, the WD VelociRaptor is a good choice. It is a 10,000 rpm 2.5" drive on a large heat sink designed to fit into 3.5" drive bays. While the capacity isn't as high as full-size 3.5" drives (it maxes out at 1TB), it's still larger than most SSD drives and can reliably deliver speeds of around 200MB/s. SSD drives have a reputation for being much faster than hard-disk drives. Aside from speed, their main advantage is their near-instantaneous seek times, as well as their ability to read many small files at nearly the same speed as one large file. This is excellent for storing operating systems and programs, as they often require accessing large numbers of small files. However, for video editing, what you really need is a sustained transfer rate, and while SSDs are still faster than hard drives for this, it's not by as much you may have thought. A high-end SSD will give you around 400MB/s sustained transfer speed, though at a vastly higher price per GB than a hard-disk drive. If money is no object, or if you don't need that much storage space, then SSDs are great. Otherwise, if you need more speed than a single hard drive can deliver at a more reasonable price per GB, then RAID drives can be a great fit. If you don't have space in your computer for internal drives, then you will need to use an external drive. External-drive performance is determined by two factors. First, the actual speed of the drive being used is important. The best external single-drive setups use high-performance 7200 rpm drives, like the ones discussed earlier. If a manufacturer does not publish the speed of the internal drive that's used, it’s probably because it's not very fast. The second factor that determines the performance of an external drive is the speed of the interface used to connect it to the computer. Sometimes external-drive manufacturers will advertise the speed of a drive’s interface as if it were the speed of the drive itself, which is not the case. Also, interface speeds are usually listed in bits per second (remember: there are eight bits in one byte). The interface primarily determines the maximum possible speed at which a drive could work. If a drive is faster than an interface, there will be no benefit, so it’s a good idea to have an interface that's much faster than the drive. Below is a list of different interfaces and what their maximum speeds are. USB 2.0: This is an old interface whose theoretical maximum transfer rate is 480Mb/s, or 60MB/s. However, actual performance of USB 2.0 is often far lower than its theoretical maximum. This interface should not be used for video editing, since it can barely play back a single track of HD ProRes HQ. Firewire 800: This is another older interface, though still a good deal faster than USB 2.0. Firewire 800 has a maximum transfer rate of 800Mb/s, or 100MB/s. While it's fast enough for simple edits, Firewire 800 is not recommended, as it is still slower than the speeds of which most hard drives are capable. eSATA: This is essentially an external SATA II connector, and has a maximum transfer rate of 3Gb/s, or 375MB/s. eSATA is able to reliably transfer data at that speed, though it does not support daisy-chaining, work with hubs, or support bus power. It is a good option for single external drives or two-drive RAID 0. USB 3.0: This interface replaced USB 2.0 and is far, far faster. The theoretical maximum transfer rate of USB 3.0 is 4.8Gb/s, or 600MB/s. However, to achieve the 4.8Gb/s speed, both the computer and drive must support the USB attached SCSI (UAS) mode. If either device is not using that mode, the performance of USB 3.0 is about the same as eSATA, which is still fast enough for a high-speed single drive, or a dual-drive RAID 0. "... if you are using RAID arrays or SSD drives externally, Thunderbolt is the best interface." Thunderbolt: This is one of the fastest interfaces currently available. Thunderbolt 1 works at up to 10Gb/s, or 1250MB/s, while Thunderbolt 2 supports an even higher speed of 20Gb/s, or 2500MB/s. These astronomical speeds are far higher than those of any single drive. Since Thunderbolt drives are typically more expensive than their USB 3.0 or eSATA equivalents, it may not be worth the price increase, since you won't see any higher performance. However, if you are using RAID arrays or SSD drives externally, Thunderbolt is the best interface. RAID 0: Raid 0 is all about speed. A RAID 0 stripes all the drives in the RAID together and is able to achieve nearly the same speed as the number of drives that are combined. For example, four 4TB 3.5" drives that read and write at 150MB/s would create a 16TB RAID 0 that reads and writes at nearly 600MB/s. Another advantage of RAID 0 is that it works with as few as two drives, so the cost of entry is lower than that of a more complex RAID. The downside of RAID 0 is that there is no data redundancy, so if one drive fails, you lose all of the data on the entire RAID. So, the more drives you have in RAID 0, the more likely you are to lose all of your data. RAID 0 configurations make for great scratch drives, as long as you back them up. There are a number of preconfigured RAID 0 drives available from different manufacturers. G-Technologies 8TB Thunderbolt G-RAID comprises two 4TB 3.5" drives preconfigured as a RAID 0, which is why it offers transfer rates of more than 300MB/s. Lacie’s 2big series of drives, which are available in both Thunderbolt and USB 3.0 versions, are also configured as RAID 0 and offer more than 300MB/s transfer rates. Western Digital also offers the MyBook VelociRaptor Duo, a preconfigured RAID 0 with two 10,000 rpm drives and a Thunderbolt interface, which should offer speeds close to 400MB/s. It's also possible to set up a RAID 0 with multiple internal drives in your computer, or make your own with an empty two-bay drive enclosure. RAID 1: Raid 1 is all about data redundancy. It uses two drives and completely mirrors them, so if one fails you have an exact copy. A RAID 1 will be no faster than a single drive, but it's the only option for complete redundancy with two drives. This is not the best option for video editing, unless you don't need speed. RAID 5: RAID 5 is a popular option for video editors. It offers much greater speeds than a single drive (though not quite as fast as a RAID 0), with protection against drive failures. In a RAID 5, one drive can fail without any loss of data. The main disadvantage of RAID 5 is that at least 4 drives are required to make one, so it has a higher cost of entry than RAID 0. A RAID 5 made of four 4TB 3.5" drives that read and write at 150MB/s would create a 12TB RAID 5 that reads and writes much faster than 150MB/s. Since RAID 5 requires more processing power than a RAID 0, the maximum speed will vary, depending on how good the RAID controller is, so it’s worth checking the individual published speed. Promise Technology offers a number of preconfigured RAID 5 arrays of varying capacities in both Thunderbolt 1 and 2. The 4-Bay Pegasus versions are capable of more than 500MB/s in RAID 5, while the 6-Bay versions are advertised as being able to reach 800MB/s, fast enough for almost any task. Since even 800MB/s is slower than Thunderbolt 1, there will be no difference in speed between the two versions. However, if you're daisy-chaining multiple devices, Thunderbolt 2 versions will work better. 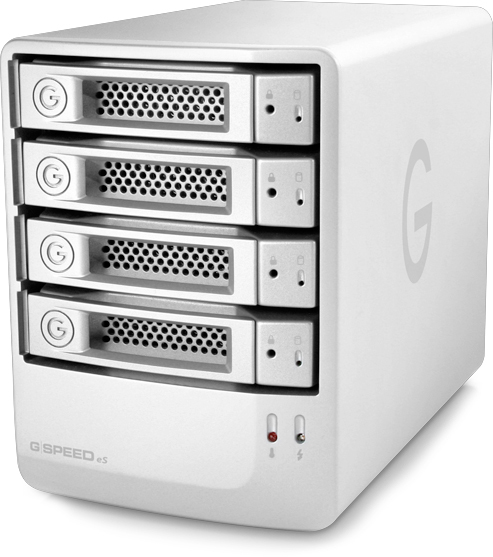 For those without Thunderbolt, who want to benefit from the high speeds of a 4-Bay RAID, G-Technology also offers the G-Speed ES Pro line that utilizes PCIe-based RAID controllers and either mini-SAS or multiple eSATA interfaces to maximize performance, such as the 12TB G-SPEED eS and 16TB G-SPEED eS. Keep in mind that a computer with a free PCIe slot is required for these solutions. Some companies, such as Drobo, are offering more flexible types of RAID arrays that can work with drives of different sizes, and allow you to add drives at any time. While convenient, they are heavily reliant on software, and are nowhere near as fast as a standard RAID array. If you're looking into RAID drives for their speed advantages, these are not the best option. "If you want to be able to use a networked RAID array as a scratch drive on multiple computers simultaneously, then setting up a SAN network is the best way to go." Networked Drives: Sharing editing projects between multiple computers can be a huge hassle. Carrying around external drives from computer to computer is both time consuming and cumbersome. Plus, RAID arrays are far from portable. Some RAID arrays are so fast that they could handle multiple users with ease... if only there were a way to share the same drive on multiple computers. Well there is, though it varies in difficulty to set up, as well as usefulness. NAS Drives: NAS drives share their storage over a TCP/IP network. They're easy to set up, and if used on fast Gigabit or 10Gb/s Ethernet networks, they can be fast enough to stream multiple high-bandwidth video tracks simultaneously. However, because of the way TCP/IP network protocols work, they are not recommended for use as scratch drives, since most editing software has trouble utilizing them. However, they can be great for backing up files in a safe way, or sharing and storing video files and projects in a safe location, since NAS drives can be configured as RAID arrays with data redundancy. SAN Drives: If you want to be able to use a networked RAID array as a scratch drive on multiple computers simultaneously, then setting up a SAN network is the best way to go. SAN drives show up as local storage to connected computers. However, SAN drives use a different file system than standard drives, so software such as XSAN or ATTO Xtend SAN must be installed on each host computer. 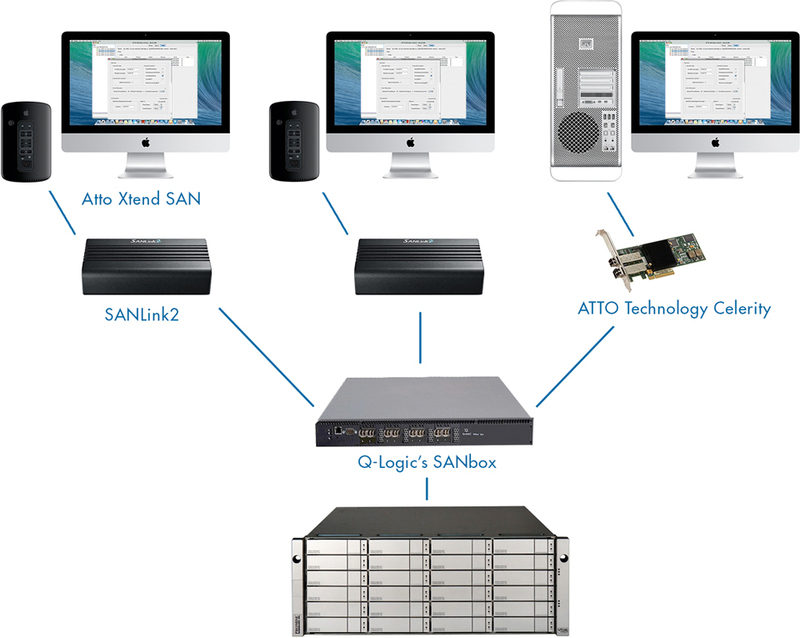 SAN networks typically interface with fibre channel connections, so each computer also must have a fibre channel host adapter, such as an ATTO Technology Celerity card, to interface with the SAN network. For Apple computers, such as the new Mac Pro, which lack PCIe slots for fibre channel cards, Promise Technology offers the SANLink2, which adapts a Thunderbolt 2 connection into dual 8Gb/s fibre channels for hooking up to a SAN network. Also, to direct all the fibre traffic between the workstations and the RAID array, a fibre switch, such as the Q-Logic’s SANbox, is required. An additional computer not being used as an editing system is required to run as a dedicated metadata server for the SAN network. Needless to say, setting up a SAN network is not for the faint of heart; however, when done, it can greatly speed up workflow, while providing data redundancy for small businesses with multiple editing computers. Some advanced non-linear editing software, such as Avid, allows for multiple editors to work on the same project simultaneously on a SAN network. SAN-compatible RAID arrays are available from a number of manufacturers in numerous configurations. One popular line of rack-mountable arrays that can be used to make a SAN network is the Sonnet Fusion RX1600Fibre, or the Promise Technology VTrak fibre array. Both of these units offer speeds more than 1,000MB/s, enough for several users to work simultaneously. Luckily, whichever system you decide to acquire to store your data, B&H most likely has it. Share a photo of your current Hard Drive setup with the tag #HardDriveWeek on Twitter and Instagram for a chance to win a brand-new hard drive! To read more articles in our Hard Drive Week series, click here. If I was rendering 4k video (on a well speced Kaby Lake setup) to a separate internal SSD SATA III drive that is rated at 525MB/s write speeds, would the rendering process be the bottleneck or would the hard drive write speed be the bottleneck? Basically what I want to know is can rendering 4k video on a realistic editing machine for today really spit out that much data per second while rending to bottleneck a 500MB/s write speed? Rendering is sort of complex and dependent on the editing software you're using. I think the Processor and the Graphics processor are extremely important to Premiere when rendering. Also how the workstations storage is configured would also impact speed. Some workstation builds can have multiple drives for scratch media that will slow down the rendering process if you use a single ssd or hard drive. Also the codec that you are working with would impact speed. Well written article, has the needed information. I am building a PC for 1080p HD video editing and have gotten to the final stages... But I am still floundering on storage. I am looking at a 256GB SSD for OS and editor, and then a HDD for importing and final export storage. How much storage and what kind of RAID do you suggest? Btw. The case is limiting me to 4 3.5" and 1 2.5" drives. I would like to edit 4k material on an external hard drive (a6300 and phantom 4) and I have a Budget of around 300€! It should have at least 500 GB (more would be better)! What do you think about the "Western Digital My Passport Pro"(is it fast enough) or would you recommend another drive. Size doesn't matter that much. The WD 2TB My Passport Pro Portable RAID Storage Drive delivers both speed and portability with transfer rates as high as 233 MB/s allowing you to transfer, edit, compile and stream graphics-intensive files quickly. I have the same question, but will be editing on a windows machine primarily. I have usb 3.1 and a type c connector port on my motherboard. Would you still recommend the same WD model (with a reformat under a different file system and an adaptor) or is there another option? Last week I took the plunge and bought the MacPro 15 inch with all the bells and wistles. SSD of 500GB. 16gb of ram etc. I do a lot of photoshop and use external disks. I have a thunderbolt on my Mac, is there and external disk I can use ? The 4TB G-DRIVE with Thunderbolt from G-Technology is an external 7200 rpm hard drive complete with a 64MB cache. The enclosure of this drive features both Thunderbolt and USB 3.0 ports, allowing you to connect this drive to a variety of computer configurations. Once connected, the drive is capable of data transfer speeds of up to 165 MB/s making it the ideal storage solution for a variety of data-intensive applications. The drive itself comes pre-formatted for use with Mac computers running Mac OS 10.7 and higher, and can easily be reformatted for use with PCs running Windows 8 or Windows 7. In addition to Mac compatibility, the G-DRIVE is also compatible with Apple Time Machine for easy backup of your critical system information and other important data files. The 4TB G-DRIVE with Thunderbolt operates using a 100-240 VAC power adapter. I have been going back and forth on this one as well. I am currently using a MacBook Pro from 2012 and will soon be purchasing a 2015 iMac for video editing. Would this drive you recommend be good for video editing while using Premiere Pro on either system? I would basically be using the drive in RAID 0 mode for a total of 4TB and then get another of the same drive (8TB) and running that one in RAID 1 (mirrored 4TB drives) for doing nightly backups of the first drive's files. This is in context to your response to Larry, I'm going in for as you recommended a minimum of 256 internal ssd storage on a new MacBook Pro, could you pls advise on RAM as well, it comes with 8gb. I'll be editing AVCHD videos on imovie and also editing on Adobe Photoshop, should I push my budget for a 16gb. Also between CPU speed and RAM, which one has more advantage for an upgrade. Everything is a balance in terms of speed. If you are looking at a MacBook Pro with only 8GB of RAM, this means it is a 13" model. It will not have the faster CPU's and also will not have an option for a dedicated graphics card. It isn't a computer I would recommend for editing. That said, in my opinion it would be a coin toss as to which would give the better performance. Each will give a little boost. RAM for bigger projects, and more applications open. CPU speed for when you are doing the encoding. If you are in the market for a computer for video editing, I would suggest sending us an email or calling our sales department. An agent would be able talk to you about you intended projects and budget, and offer a couple recommendations. I am looking for a external option that will allow me to edit 4k footage quickly while also having redundancy. What is the option with the best value that will allow me to do this? Do I need to go with Thunderbolt? Will USB 3.0 work? Also wanted to add something which i didn't see glancing over the article, is that SSD's have a limited read/write time, so to constantly be using that for videos, is not recommended. For a portable video editing drive array, The G-DOCK ev with Thunderbolt storage solution is a two bay, swappable drive system with user configurable RAID 0,1 and JBOD and is designed to optimize the digital content workflow. Part of the Evolution Series, G-DOCK ev ships with two hot-swappable USB 3.0 G-Drive ev hard drives for convenience and portability. Pop in any combination of G-DRIVE ev hard Thunderbolt ports for up to 10Gb/s data transfer speeds as well as daisy chaining capabilities. With Time Machine compatibility you can plug this drive into your Mac running Mac OS X 10.7 or higher and begin saving and backing up your data.drives into the G-DOCK ev for ultimate flexibility. Yes, it would be able to hande both a souce and export drive and would provide faster performance. Thank you for the excellent and clear information. Been bumping my head for weeks on the topic. "The main disadvantage of RAID 5 is that at least 4 drives are required to make one" - Not true, 3 is the minimum. "However, because of the way TCP/IP network protocols work, they (NAS) are not recommended for use as scratch drives, since most editing software has trouble utilizing them. However, they can be great for backing up files in a safe way, or sharing and storing video files and projects in a safe location, since NAS drives can be configured as RAID arrays with data redundancy." Can you describe what you mean about editing software having trouble utilizing NAS storage? I'm considering a NAS solution from Synology in RAID 5, direct connected to 3 collaborators via Gbe working with XDCam EX footage. A NAS is an excellent storage solution, but for rendering and editing purposes, an external, directly connected drive is faster and more reliable choice. This article was very helpful and informative. Thanks B&H. Can anyone tell me if my 2012 12 core Mac Pro supports USB 3.0 with USB attached SCSI (UAS) mode please, I'm not having much luck finding any info about this. Unfortunately, the Mac Pros pre 2013 are USB 2.0 only and would not support UAS. I was interested in your thoughts about the benefit of using two drives for video editing. One internal drive for the operating system, programs and such items that are not changing. Likely the SSD drive. While the other being the fast external disk drive for the video content that is being changed. The advisor said that the two processes were less likely to be competing for the same transfer band with. The advisor, a major hard disk vendor tech, said the editing job will be smoother using combined drives, rather than one very large (TB SSD). His point was to reduce the internal SSD drive in half, and save the money to more than buy a very fast external drive. So better and less money is good if it is true. I agree. Select no less than a 256GB SSD drive for the OS and the video editng software. Bigger is better in this case, and the prices of the internal SSD's have been falling to the point that investing in 500GB or 1TB SSD's is wise. Investing in a fast, reliable, external drive is always our recommendation. We love the drives from G-Technology for video applications. I've been in the market for an editing laptop however specs given for laptops provided, are limited.. any recommendations? perhaps it would be best to get an external hard drive for my video and media cache, linked via thunderbold or usb 3.0? Thanks! 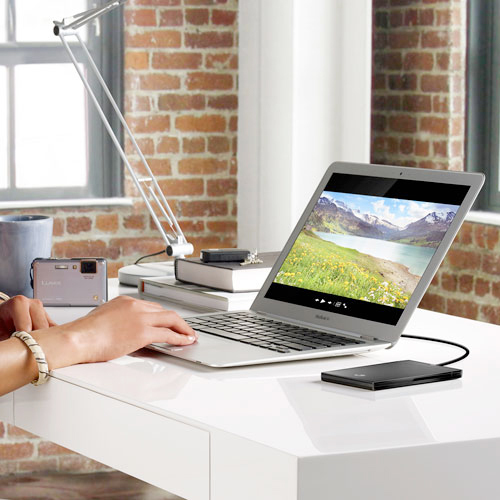 An external drive is recommended for virtually any video editing work-flow. Quality external drives, like those designed for video editing from G-Technologies, offer larger storage capacity, faster seek and transfer speeds, are more reliable, with stronger construction and better warranties than the embedded drives often included with laptops. The G-RAID mini 2TB Dual-Drive Storage System from G-Technology is a versatile dual-drive bus powered storage system with a variety of ports including two FireWire 800 ports and one USB 3.0/2.0 port. Along with the variety of connection options, you can take advantage of a total cache of 32MB and a 7200 RPM disk speed ensuring you can read and write to your drive quickly and efficiently. The drives in my Pegasus 2 R4 are filling up fast and I would like to replace them with larger drives. I was thinking in the 3/4TB per drive range. What should I look for? What drive would you suggest? I need help making a decisionon the product linked below. This article was very helpful and appreciated. Most of the work I do is done with adobe products such as photoshop, illustrator, muse and more. I just started getting into video editing with Premeire and animation using after effects. When I say I just started I mean like I just started mesing aroundlast year with motion graphics. I have enough money for the product below and was curious if it will fit my design needs and also be good to learn after effects with. SSD for rendering. I am using Edius for video editing and they recommend using a media HDD and also having a HDD for rendering. It seems from you post that todays SSD's will do the job for editing, but are SSD's OK to use for rendering? Right now I have two WD VR's installed. One is for my media drive and the other for rendering. But they are getting up in age. So when they do die I was hoping to be able to change over to SSD's. Ideally, the best setup would be to use a SSD drive for Windows and the Sony Vegas software. A secondary & third hard drives 7200-10000RPM for video and rendering. You could you use SSDs for the video and rendering drives as well but they will not be as beneficial. Don’t forget that latent disk errors are one of the biggest problems with RAID technology. If you are rebuilding a RAID, Unrecoverable Read Error (URE) can stop a RAID rebuild in its track, essentially making the entire RAID volume unusable. Typical ranges for hard drives are around 1 x 10^14 bits which means that 1 out of every 10^14 bits cannot be read. This means if you have 12TBs or 12x 1TB drives your probability of encountering a URE is one (i.e. it’s going to happen). If you have 2TB drives, then all you need is 6x 2TB drives and you will encounter a URE. If you have a RAID-5 group that has seven 2TB drives and one drive fails, the RAID rebuild has to read all of the remaining disks (all six of them). At that point you are almost guaranteed that during the RAID-5 rebuild, you will hit a URE and the RAID rebuild will fail. This means you have lost all of your data. Super awesome article. This is why I keep going to B&H. What would be the way to set up an external hard drive solution for bouncing back and forth between a rMacbook Pro and say a beefy Windows desktop? A lot of my video files are larger than the 4gb max for the FAT formatting that allows me to go between Mac and Windows, would a network of some kind be the only way to have a drive that is formatted for both that allows me to use the source files? The best option would be exFAT. On current operating systems it can be read, and written to with both Mac OS, and Microsoft Windows. You also don’t have that pesky file size limit. Thank you for writing. Very informative. Would you (or other users) include the G-tech USB / 7200rpm / 226MB/s transfer rate in your high performance 3.5" drives? Suitable for video editing? Great article, you explain storage to the normal folks in a way I couldn't hope to. I am always curious about video editing types, why do they choose the Mac ecosystem when worried about hardware bottlenecks? I am 100% serious and not interested in a flame war, just data. Is it the operating system being easy to use? Are folks only interested in flipping the power switch and running their app and thats it? I guess I don't understand why you wouldn't start with an HP or Dell workstation that can expand into anything and have a lot more cores and RAM. Certainly more GPUs. You can run BSD if you really love the Mac OS on other hardware. Maybe it is a software thing leftover from the 90s when the risc processors were better than intel? Why would you trust your bread and butter to a generic raid array like a bargain basement Promise? Or the consumer drives listed vs enterprise drives? I'm an IT guy, I honestly don't know. When I design a system to meet the application/users needs I usually nail it. Video is the one that always confuses me. The logical choices are not the ones that are chosen. Great article! Just in time, as I am struggling with what to purchase for my newly ordered Mac Pro (3.5GhZ 6-core Intel Xeon - 32GB RAM - 1TB SSD - dual AMD Fire Pro D700 with 6GB of graphic RAM). I am contemplating to get the following storage solution - sold at B&H - for editing Pro Res 1080P at 24FPS on FCPX 10.1: OWC Thunderbay IV 8TB ( manufacture#owctbivt08.os) high performance 4 bay (this is thunderbolt 1 I believe). For backup, I am looking at the OWC Mercury Pro RAID 8TB with USB 3.0 connection (manufacturer #owcmed3fh7t8.0). The ThunderBay IV is an excellent choice for your needs. (B&H# OWT48 )It will provide about 6TB of usable space when configured in RAID 5 and be more than sufficient in terms of speed. The Mercury Elite Pro (B&H# OWMEAPQ8 ) is a two drive RAID. In RAID 1 (Mirror) it will only provide 4TB of usable space. You can set it to RAID 0 for use of the full 8TB, however there would be no redundancy in your data. If one of the two drives fail, your information would be lost. I'm in the same boat. Have the same Mac Pro. Just bought a thunderbay drive 20tb for media. I'm still confused about my scratch disk. Do I get a separate disk as my scratch and a separate disk just for cache? Or one disk for both? It is not necessary for a separate drive. For best performance, dedicate a drive or array strictly for your media assets. Choose a disk for the assets other than the disk where you keep your project file, operating system files, or the files for applications. By default, scratch disk files are stored where you save the project. The scratch disk space required increases as sequences become longer or more complex.